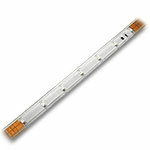 This Warm White LED Wall Washer is a 20" x 2" linear type light with 22W 24VDC rated power use. 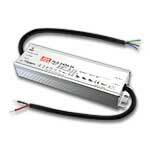 It has 18 warm white - 1.2 watt Edison LEDs to produce bright and vivid lighting on walls, buildings, ceiling and signs. This light fixture can project light up to 100 feet. This light is encased in an IP65 water-resistant aluminum housing. Tempered glass and stainless fasteners give this light long lasting outdoor use. 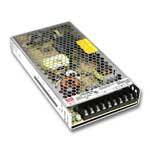 This light can be dimmed by any 24VDC Constant Voltage PWM Dimmer. 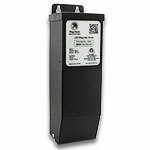 We recommend no more than six 22 watt wall washers connected in a series. Attached male and female waterproof connection lead wires included. 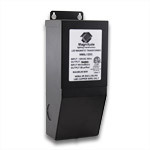 For easy connection of wall washers, power supplies and dimmers, use the many waterproof connectors wire options. 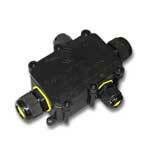 UV proof, Non-submersible, RoHS and CE approved. 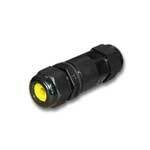 This is an 86" long 3 port T or elbow waterproof connector that can be used to connect up to 4 White or Warm White LED Wall Washers to a 24VDC power source. With 21" of wire between each T connection, this wire allows for a simple parallel connection of multiple LED Wall Washer fixtures. Use with our many other wall washer connectors for quick and easy waterproof wire connections.